Dear Food – An imperfect food blog for everyday gourmands. So what makes this traditional Thai dish a fib? Well, technically speaking, it does not use the same, or even quality, ingredients. No tamarind paste, fish sauce, sauteed veg – nothing as characteristic – goes into this dish. But do not fear, friends. SS&S is meant to be about cutting corners to eat like the gourmands we want to be, not as much about authenticity. And I can confirm, this one’s a keeper! Cook the pasta according to the directions indicated on the box. Drain the pasta and place into a large bowl. Scoop PB into a microwave-safe bowl. Heat VERY shortly, around 10-15 seconds. This will soften the butter just enough with scorching it. Mix in the soy sauce and the sugar with the heated PB. Let sit for about 3-5 minutes. Pour your PB mixture over the spaghetti and thoroughly toss. From there, there are certainly some optional garnishes: bean sprouts, eggs, tofu, chicken, onions, red pepper flakes, lime. The choice is yours; use what you’ve got! Hope you guys enjoy this one. More to come! Today, we are excited to announce the launching of our new Dear Food series we’d like to call Student, Starving, and Savvy. Written through the eyes of just one college student, the ideal of dining like true bons vivants is worth the financial pains. Worthy of the efforts of scrimping and the echoing of hollow wallets to scrape every penny and dime from the proverbial piggy-bank. And yet, the shadow of realism clouds above, and we must sober from our fine wines and remember that a life like this is simply not so doable. Perhaps, and as we hope, it’s just a season of life to be in, where hard-at-work students hold dearly their Top Ramens and Cup-of-Noodles with not a sense of true pleasure, but induced dependency. Sad and pitiable this chapter of American culture lives, says this foodie. Student, Starving, and Savvy (or SS&S) is meant to be an outlet welcome to those who want – and deserve – a decent meal. Curbs may be cut, showmanship missing, but making the right investments is good for our not only our bodies, but our preservation of a culture to share a meal. More importantly, this series is not only meant for college students. I invite, nay encourage, anyone who just wants to save or is short of time at home to check out some of these on-the-fly recipes. With any luck, we can make some great meals together. Enthusiastic, at least, to begin, I will be kicking off the series beginning next week with our Cheater Pad Thai, which uses only four staple ingredients. Until then, dine well and be merry, Dear Food friends. When did summer begin? June 21st, no? Just a week around the corner, and yet the barbeques have been set aflame and s’mores already toasting over fires. ‘Tis the season indeed, and on behalf of Dear Food Girls, cheers! Let’s chat fruit, shall we. The stuff works hard all year ’round, but doesn’t it just light up your life? Biting into the juices of a strawberry in the summer noon is far more appealing than in the icy breath of winter. Melons, tropical fruits, berries up and down the alphabet, it all just works in the summer time. Plus, let’s be honest, they’re at their most versatile in the summer as well. Cakes, cobblers, pies – what can’t you put fruit in? So I did some pondering on a warm afternoon and decided to pose a question: what about fruit and chocolate? First myth debunked, they go together just as well as any other compliment to chocolate, the stuff of gods. 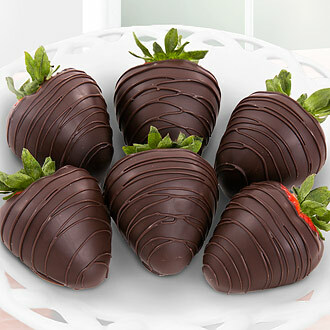 Especially the seasonal treat of chocolate covered strawberries; the dunk, the bite, the joy. But can we keep going? Can we keep pushing boundaries? Thinking aloud, chocolate and orange is common in my family during Christmas time when slices of dark and orange are segmented as an ode to the citrus fruit. Blueberries and white chocolate waved through the center of a cheesecake is most welcome any time of the year. And for an especially unusual one, I was once served for dessert a slice of pineapple with whipped cream, a cherry, and milk chocolate sauce drizzled across the plate. Crazy? Try genius! All this said, we need some feedback from our readers: what are your favorite fruit-and-chocolate combos? And not just favorites, things we haven’t thought before! Grapes and white? Papaya and dark? We want to hear from you! Also, give us the lowdown on some summertime recipes! The times aren’t cooling down, and our craving for sweet treats isn’t going anywhere either. Vidalias preferred, generally sweet onions are available basically all year. In fact, since childhood, my family has picked sweet onions but the bunches over yellow and purple. I don’t think they have a beef with the other colored roots. I think sweet onions offer a dynamic to any savory dish: a sugared yin to the salty yang. With a couple of bulbs staring me down in my kitchen, I thought it time to put the veg to use. Most often, onions in our home our used in spaghetti sauces or sometimes as a taco topping for my Meatless Monday Guacamole Tacos (No recipe? I should look into this.). But instead of a fine dice and a fragrant aroma, I’ve decided to opt for something totally new. You see, other than these onion, layers of puff pastry await their call of duty. And now the call has come; for sweet onion tarte tatin. Bear with me, it’s my first time with this French pastry, but in my limited cooking experience, it’s all about the inside. Cutting and baking the pre-made puff shouldn’t prove a problem. With insides in mind, I will chuck a few small cubes of butter in my (oven-proof) pan. People sometimes ask if it will make a difference using oil or butter, and while the goal of softening is the same I think butter is a far better caramelizing agent. As the globs melt down, the onion gets controversial. From here, it depends on how one feels about them. I LOVE them, so rough, edible chunks I think are most appropriate. Tossing them into the frying pan with a little time to mingle, a tablespoon or two of brown sugar creates a sticky and syrupy base for the tart. To cut through the sugar, white wine vinegar goes in too (red wine or Balsamic vinegar, my guess, would be equally fine, but I used it all for my balsamic reduction the other night…whoops…). I’m removing from heat and cutting out my pastry to fit the width of the pan (should’ve measured BEFORE frying…little tip!). Crack an egg, wash the top, and pop in the oven at around 400 degrees (F) for a good 20 minutes, perhaps slightly less. In between, I will be praying for golden, crispy pastry. The result? Well, as the 0nion chunks swam in a pond of syrup and then crystallized on the pastry, it actually all came out in a fairly graceful plop onto the plate! Admittedly, I think the pearl onions or shallots would have made more sense now, as still the rough onion chunks did stick to some degree, and thus a complete unfolding did not occur. No matter! Taste-wise, crispy, buttery pastry and sugary onions pair so well, making a savory dish borderline sweet! I sprinkled my with a little time just to take it home! I would suggest a more structured recipe, much like the ones SORTEDfood offers (check out their website, https://sortedfood.com/ ). I really do believe that once you get the method down, you can totally make it your own! Now, I used sweet onions around the house to creative something finer, but we want to know what other simple ingredients you can transform completely! Comment below, share your photos, and tag us on Instagram or Facebook! 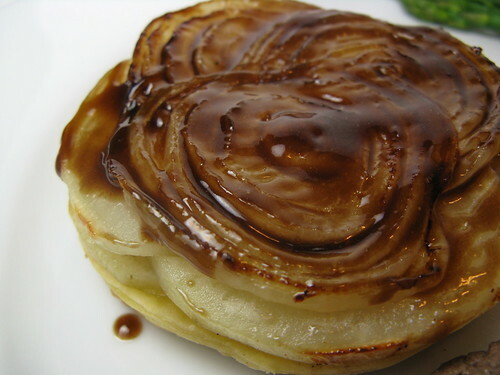 In the meantime, here are some similar recipe photos of other, similar, onion tarte tatins! Where does the film critic in me cross over with the foodie persona I write as? 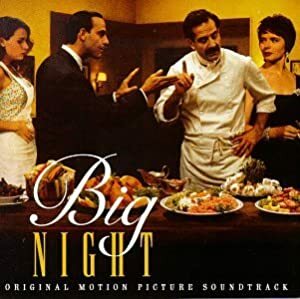 In one of many cases, Big Night, directed by Campbell Scott and Stanley Tucci (in context, the latter played Julia Childs’ husband in 2009’s Julie & Julia, another foodie picture) and released in 1996. It’s a delightful comedy, nimble and charming not far off from something in more recent memory like Ratatouille. Like the very best restaurants, watch and engage in the film for the food and fun, but you really stay for the environment created by Scott, Tucci, and co-writer Joseph Tropiano. 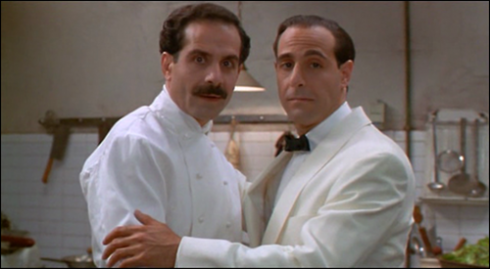 The film follows a pair of Italian brothers (Tucci and Tony Shalhoub of Monk fame) who have migrated from Italy to New Jersey with aspirations to bring their familial love of cooking and food to New Jersey. Secondo (Tucci) runs the business side of things, getting customers and ensuring the best service possible with his smooth-talking, while the shyer Primo (Shalhoub) runs the kitchen. Right off the bat, the dynamic is perfect and yet familiar to watch unfold between these two characters. However, their restaurant “Paradise” is facing financial pressures, and even the grandiose competitor restaurant owner Pascal (Ian Holm) is barely able to help them. It is then that the heat is turned on, so to speak, when Pascal promises to persuade Louis Prima to attend “Paradise” for one evening, creating a buildup of professional and personal stresses between the brothers. Finite complications arise, too, as slick Secondo is dating the kind-hearted Phyllis (Minnie Driver) while having an affair with Pascal’s wife (Isabella Rossellini). Primo’s affair lies exclusively in his work, as he pours his joy and care and everything that makes him a good man into his dishes, to the point where his relationships with out people are drained out. These actions bubble up to the “big night” of the celebrity’s guest appearance, which may safe or dispose of their business and their dreams. Scott and Tucci play with the Italian-American stereotypes in just the right ways; making the comedy lively and still somehow realistic. The script remains the most genius aspect of the film, as the rising of the action to the “big night” cuts deeper into the layers of commitments to family and friends. Both brothers, granted with their flaws and inabilities in the American business model, are forced to overcome surprising obstacles because, at the film’s core, they share a love for their restaurant and their heritage. Big Night is an absolutely magical film from start to finish. Playing on Netflix as we speak, it’s not one to miss, both from a foodie and film-going perspective! I take pride and, in many ways, courage to flaunt that I enjoy just about every vegetable. Oh, that’s nice, you might think. But I’m not quite sure if you understand: I love about every vegetable even on its own. A Thanksgiving yam needs no brown sugar or butter to satisfy my sweet and savory tooth. Spinach need not the bulking of cream or cheese to deliver the greens down my mouth (although, a little dressing wouldn’t HURT). Even peppers and onions can skip the sauteeing process – Just be yourselves! I say. My enjoying vegetables does not quite come as a rule of thumb, however. If veggies are the governing law, then there really are exceptions. One such exception takes the shape of a wadded-up tissue, green from the forest, and smells of what I imagine the feet of the archaic might taste like. 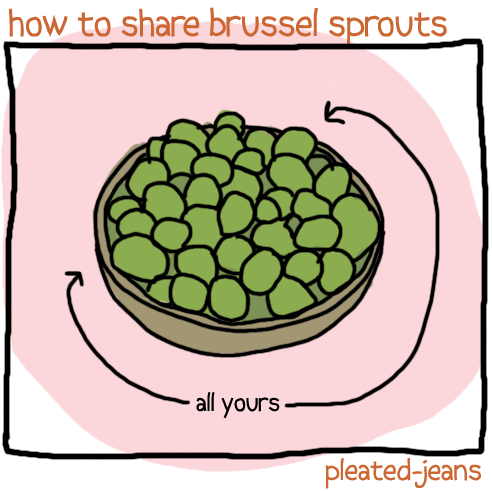 All rudeness aside, I am, indeed, referring to brussel sprouts. But don’t misunderstand me, dear reader. I do not report on this pungent greens because I immediately hate them, but because I want to like them. And so, I leave their fate up to you: how do YOU prepare and enjoy your sprouts? But what are some other ways to enjoy these super greens? Comment below, post your pictures, and hopefully I can try them myself and finally change my mind. “Fresh goat’s milk, produced just this morning.” This is one wonderful, hardworking woman. Food Meet 2015 met in a little conference center here in Newberg, Oregon. About a hundred were there to congregate; farmers, artisans, foodies – all were welcome. A sampling of dinners from around the area paired well not only with the summery Earl Grey Kombucha, but a lively rounds of conversation about food, organics, and ethics. The event was hosted by Corwynn Beals and his student Praxis team. Their goal was to get students and locals talking about food. Why is it easier to get it in a superstore than the local market? What should the future of food look like? What works, and what needs to change? These questions, and more, were begged. And boy, were there people talking. What I was taken with, as a humbled guest to this event, was simply conversing and listening with the local farmers. We hear about the issues of organics and food accessibility all of the time. Yet, it would seem its a discussion that rather bobs in and out of our minds. You listen to a true artisan – one who’s really devoting their time, their life – to this, and everything changes at the snap of your fingers. Never have I talked people with such passion in their hearts and minds. For me, the pulled-pork slider was a highlight (Picture #3). As one who’s not always a big fan of pulled meats, this one just clicked for me. My first problem is the texture of pulled meats, but this one melted like a lemon drop. The other beef (or pork) I have is with the messiness and sloppiness which traditionally entails. But the smoky, salty, sweetness WITHOUT the mess? Heavenly. It reads, “Eating is an agricultural act.” – Wendell Berry. What role would you like to see food play in your future? How can we improve the way food is produced now? How can I appreciate the local farmers who provide for me now? Keep on thinking, dear readers.